Brantham is border country. The rather industrial village straggles down to the muddy Stour, and on the far bank sits the fine Essex town of Manningtree. The busy Ipswich to Manningtree road funnels through Brantham and is rather unpleasant, I'm afraid. This is not cycling country. But the church is away from it, tucked among cottages in a little lane, and you wouldn't know any different. The most striking sight as you approach St Michael is E.S. Prior's wonderful Arts and Crafts lychgate, all curves and dynamic tension. It is quite different to his other Suffolk piece at Kelsale. It really is a beautiful object, and would grace any church. St Michael looks attractive behind it, a pleasant village church, despite being thoroughly Hakewilled in 1869. E.C. Hakewill was one of the 19th century's less distinguished architects; his work is sound, but not outstanding. 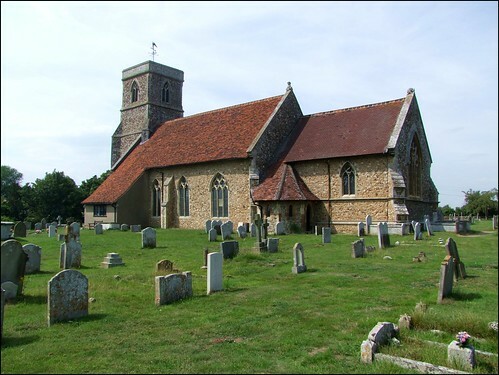 Typical Hakewill churches include Shottisham and the old part of Rushmere St Andrew. His most familiar motif is a north aisle which slopes down under the nave roof to within five feet of the ground; there's one at Shottisham and at Rushmere, and there's one here, too. Hakewill reset headstops from medieval windows rather oddly at the west end of the south aisle, and his little vestry tucked in at the other end of that aisle is really rather lovely. E.S. Prior's lychgate is, perhaps, an unlikely adornment for Hakewill's work, but is drawn into unity by the churchyard wall, also Prior's design, which incorporates a funny little gate and then runs along the edge of the steeply banked graveyard close to the western face of the tower. St Michael has a fine setting, sitting squarely in its wide graveyard, the tower peering to gaze westwards out across the graveyard extension. The lower part of the tower is still pretty much all its medieval self, the upper part Hakewill's. I like the jaunty figure of St Michael on the wind vane. This church is proudly, militantly open every day, and you step into a plasantly rustic interior, miles better than the 19th century restoration a few miles off at Stratford St Mary. The hand of Hakewill is a light one here. He reset a piscina and image niche inside the church, possibly not in their original places. He also reset some fragments of medieval glass. The 19th and early 20th century glass is generally good: that in the west window beneath the tower is later than that to the east. Another striking 19th century feature is the magnificent pair of corbel angels either side of the chancel arch. One is St Michael, the other St Gabriel. Their style is reminiscent of the 1890s drawings of Beardsley and Mackintosh, although it reminded me even more of the work of the Glasgow artist Alasdair Gray. The pulpit is also in an Arts and Crafts style, but was the work of a parishioner.This church has a painting by John Constable which used to stand behind the altar. It was one of three local church pieces (the others were for neighbouring Manningtree, and Nayland, the best). This one shows Christ welcoming the children, and hangs on the south chancel wall - or, at least, a copy of it does. The original has long since gone elsewhere. The grand organ pipes above the north doorway are an unusual feature, and the lectern remembers Captain Charles Berjew Brooke, son of Charles Berjew Brooke and Maud Gwenddolen Brooke, of Colne House, Brantham, Suffolk. Their son was one of many Suffolk soldiers killed on the 1st July 1916, the first day of the Battle of the Somme. He was mown down while leading his men into battle. He was just 21 years old.